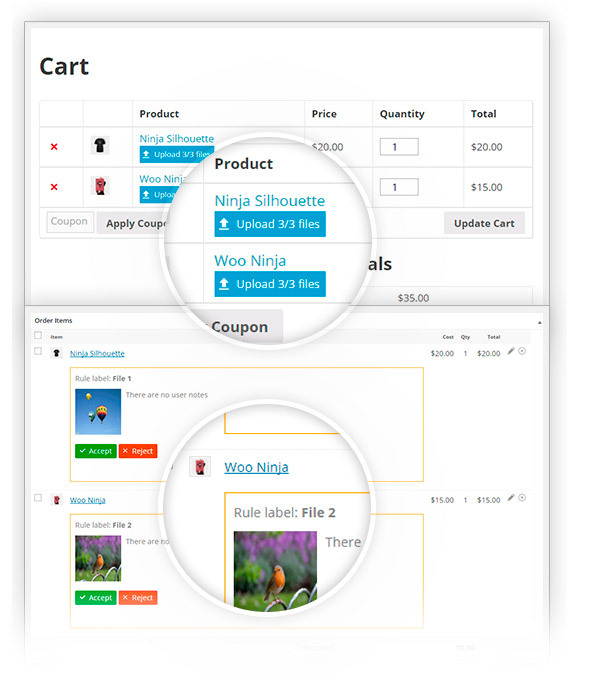 The freedom to customize your orders is an advantage that assures to users that extra that others don’t have. Let them upload images, text documents, or any other file with YITH WooCommerce Uploads, and meet the needs of yours and your customers’! 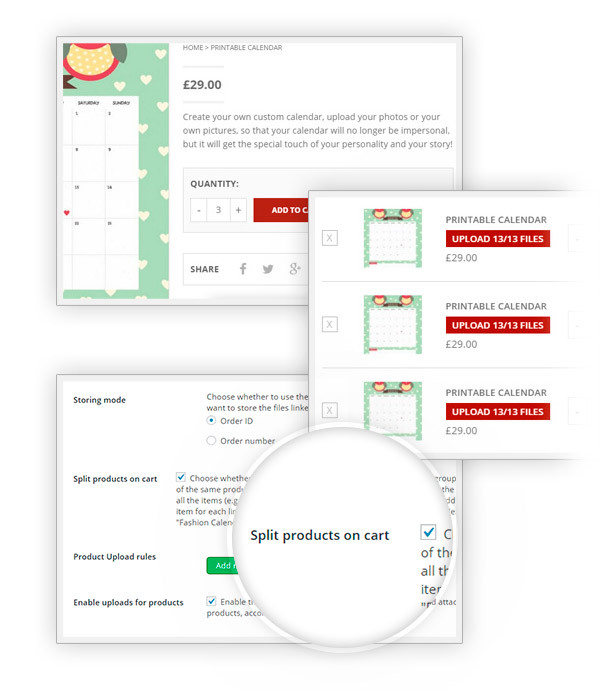 The aim of this plugin is simple: helping you with your e-commerce site management. 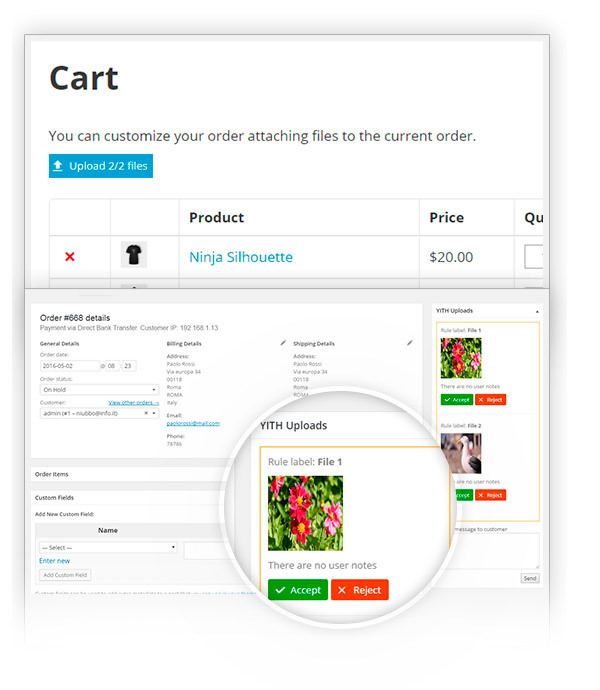 Whether you offer the freedom to customize the T-shirts you sell with an image or a text, or you need specific signed documents, or maybe you want to let users upload a particular file for those orders that involve customizations, YITH WooCommerce Uploads is what you need. Think about how uncomfortable would be receiving all those files via email: it will easily generate chaos, and you could lost all the attachments of your customers — who would not be happy at all to receive a printed T-shirt with the image of someone else. 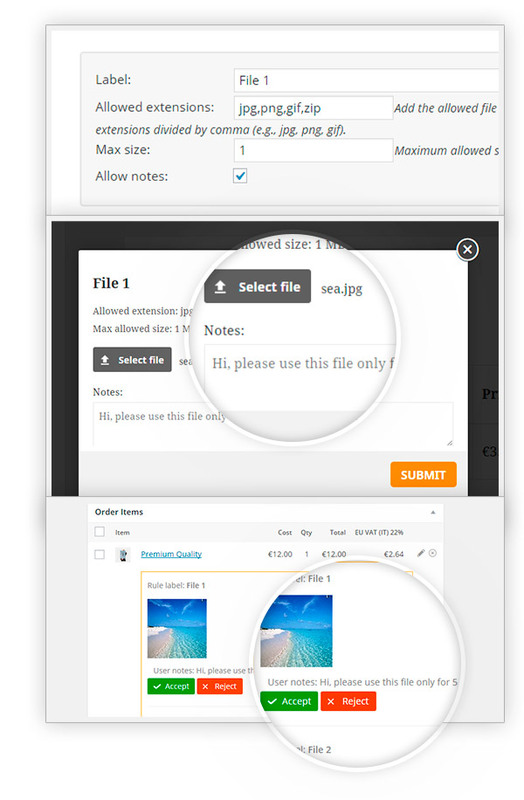 Luckily, YITH WooCommerce Uploads solve this problem and, letting the upload of any file, it organizes orders and related attachments in a tidy way, leaving no space to confusion! unable to save variation rules. 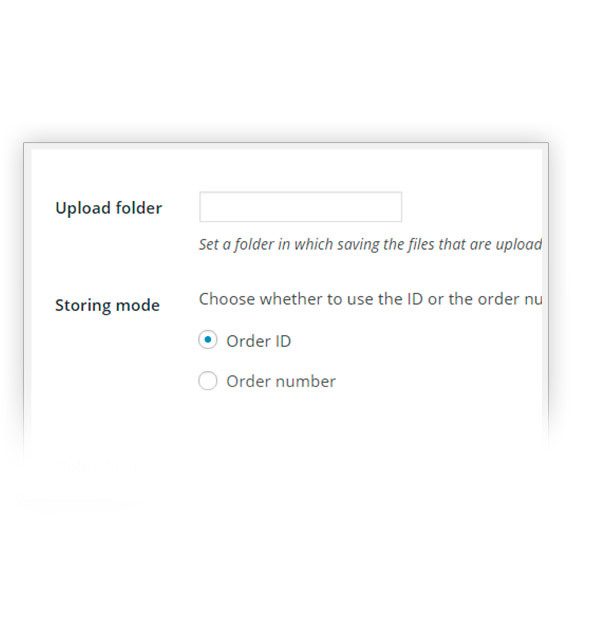 Fixed: upload fails when the option Storing mode is set to "order number"
Added: you can add different upload rules for each variation instead of using the same rules for any product variations. 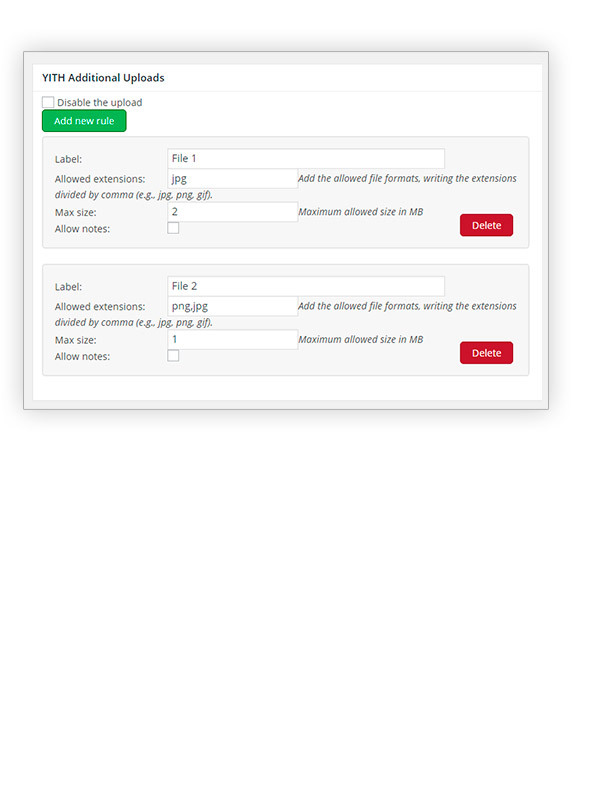 Added: users can edit uploaded files even from cart page.  Fix: removed deprecated woocommerce_update_option_X hook. Manage user files and, in case, offer them a second chance to upload a new file. With the premium version of the plugin, your customers can upload attachments directly from the product itself (from the cart or the ``Thank You`` page). 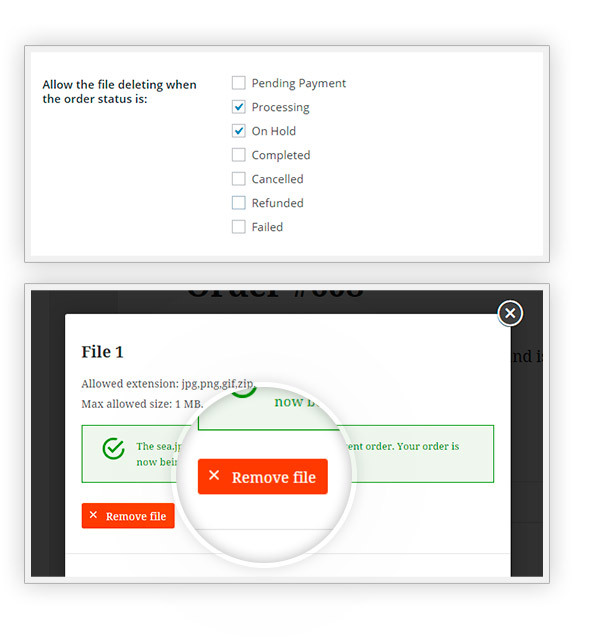 Choose according to your needs or deactivate the feature to attach files with certain products. Set the order status in which users can still change their attachments and let them free to choose! You and your customers can add notes to give more information and have a get result. 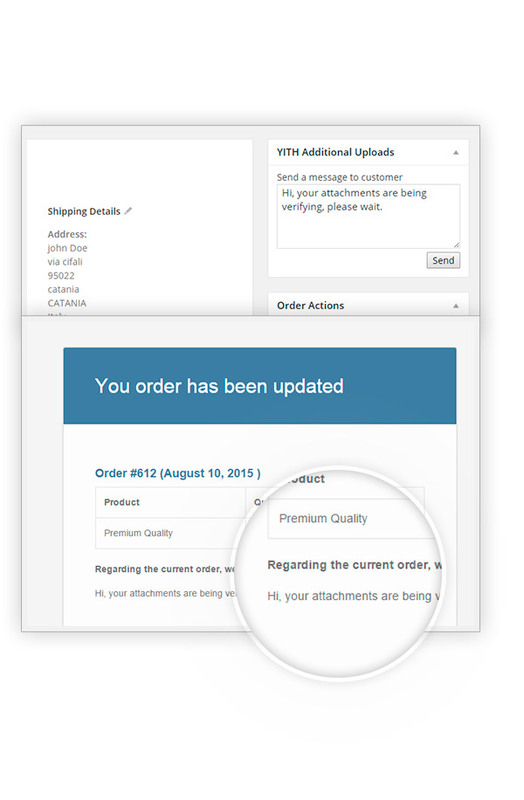 Thanks to a rapid email system you can use to send messages from the WooCommerce order detail page. Notify your users if their files have been accepted or declined. Sort them by order ID or by order number, you will find them more easily! 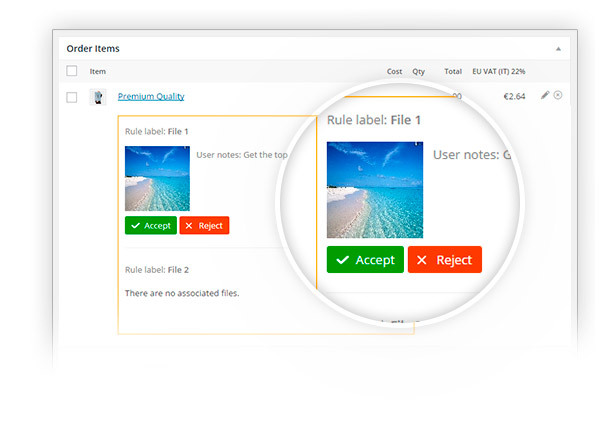 Just greatThe plugin offers great functionalities like the possibility to disable uploads for certain products and send emails for accepted and rejected uploaded files. Support was excellent even though I haven't contacted them for technical problems but only to ask for a suggestion. Very friendly and reliable. Useful pluginA good plugin for a reasonable price. Allowing our customers to upload files makes our job much easier. Very satisfiedSo happy to finally find this solution, I already had some of your other plugins and of others too but nothing for uploads and it was not included anywhere, it allows to make custom upload rules as well which was a nice surprise! I would like that we can upload a file from the Wordpress Admin for the client, in that way, this field will be displayed and downloaded by the user from is MyAccount page. Is it also possible? - Unfortunately not, I am sorry. 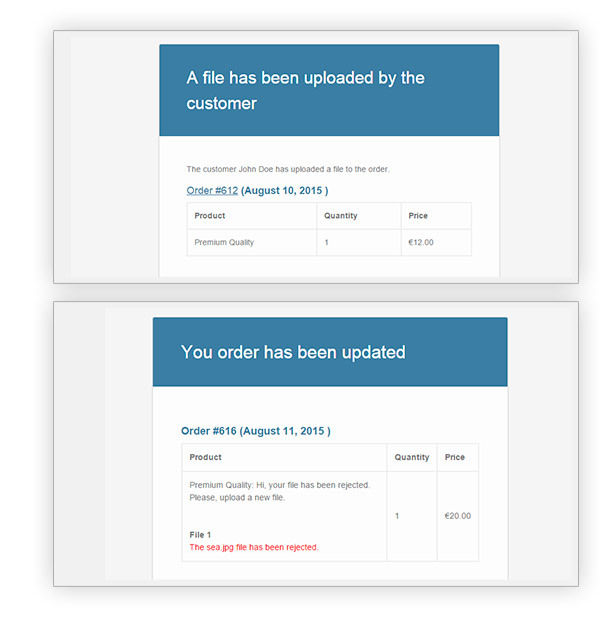 The plugin has been created only to upload files by the customers. The plugin (free and premium) should be compatible with the Flatsome theme, if you buy the premium version the support team will do their best to fix the issue if it occurs in the premium version as well. 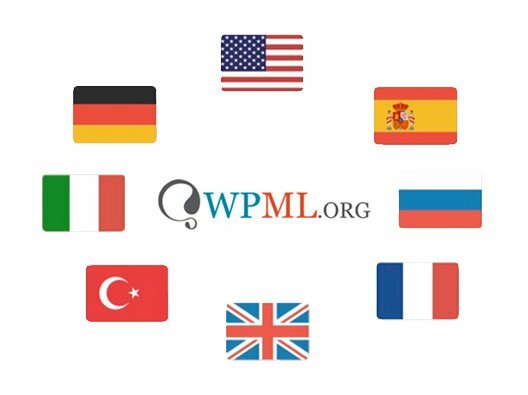 Furthermore I would like to ask you to check out the premium version in the live demo we offer (click on "launch admin demo" to enter backend). There you'll be able to see where and how customers can upload files, and how you as admin, can set it up. unfortunately, this is not possible with this plugin. The files will be stored in the Uploads directory through WordPress and it's not possible to send it via email or something similar. are uploaded to the "Uploads" directory of WordPress. 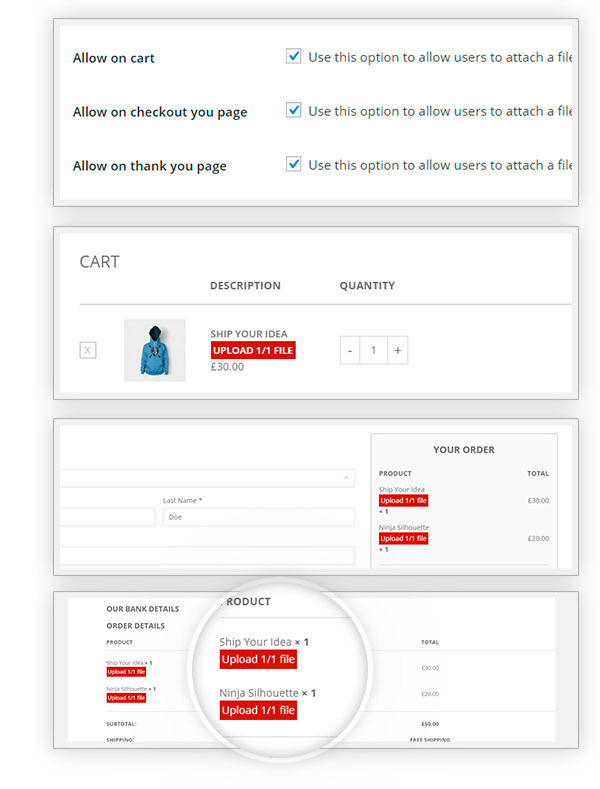 This is currently not possible, the button can only be shown in cart, checkout, thank you and my account pages.